“The point is that trade is not important for the U.S. economy. 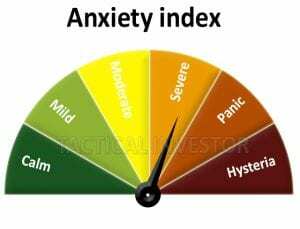 However, it is very important for Europe and Asia and EM,” Slok stated in an email to Yahoo Finance. This limited exposure is due to our sizeable domestic consumer market and the fact that we are blessed with a plethora of natural resources. 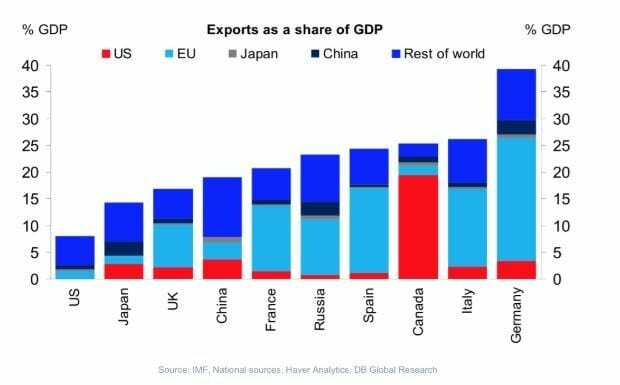 This gives the Trump administration a lot of room to manoeuvre; throw in the fact that the US dollar is the world’s reserve currency and there is almost no way that China or for that matter the EU can win a trade war with the US. Germany is going to be the first one to buckle over and come to the table, but the outlook for China is far from bright. The longer China holds out, the harsher the punishments dished out by the Trump administration will be. Markets are forward-looking beasts, and Chinese Markets have all but agreed that China has lost the trade war. The Shanghai index is plunging, the Yuan has lost a significant portion of its value, and now Chinese investors are bailing out of the markets. The Shanghai Index is likely to trade as low as 2400 with a possible overshoot to the 2000 ranges before the dust settles down and the longer China holds out the greater this fallout will be. Finally, take a look at the US stock market; it’s holding up remarkably well and after this period of consolidation is over we expect this bull market to soar higher. 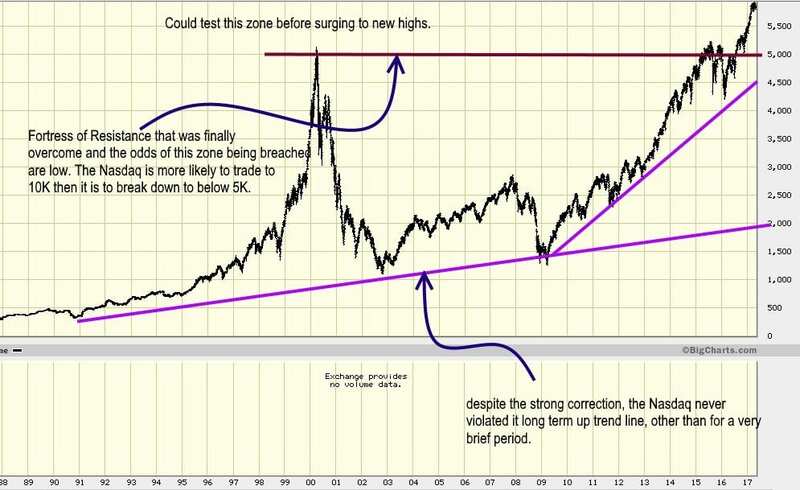 The chart below is a few months old, but the reason for using it is to bring across the point we have been making for several years; this bull market will not end until the masses fully embrace it. 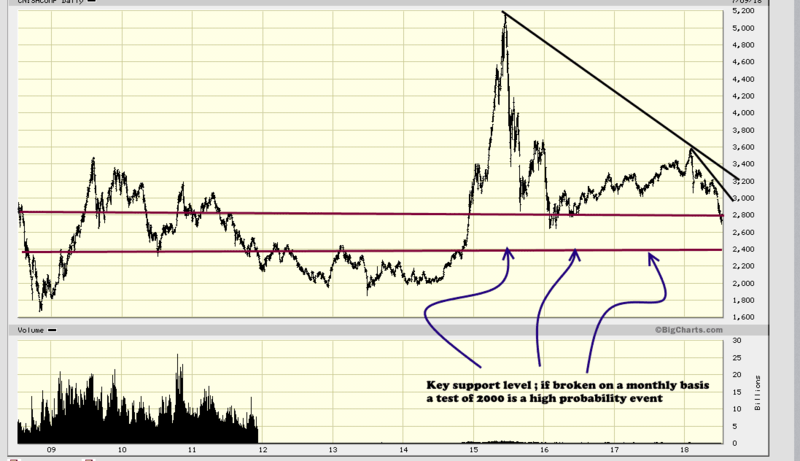 The Nasdaq is in a solid uptrend and it is more likely to test the 10,000 ranges then trade below 5,000. While there is a chance that the Nasdaq could test the 5000-5500 ranges before blasting off to 10K, the odds are low and if it does come to pass, we would view it as a splendid buying opportunity. What drives the markets? 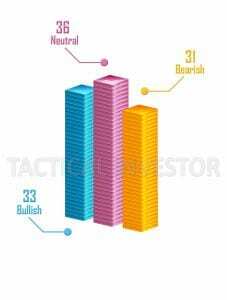 Most individuals will state that it is either fundamentals or the technical structure of the market; sadly to state both groups are wrong. Emotions drive the markets and even though machines perform a large part of the daily markets transactions; their programmers are humans. Only when machines start programming machines might we arrive at the day where emotions play a minor role. For the record, there is a way to track machine behaviour using the principles of Mass psychology. Logic is nothing but a perception, and that perception is based on an emotional construct. What’s logical to one could appear utterly illogical to another human, and that will apply to AI one day.